72 people are dead in just 3 days, all of them consumed an adulterated liquor that they got in Uttarakhand and Uttar Pradesh. The police say that 36 people died in Saharanpur a district in Western Uttar Pradesh, 8 were dead in Kushinagar a district in eastern Uttar Pradesh, and 28 people died in Uttarakhand. 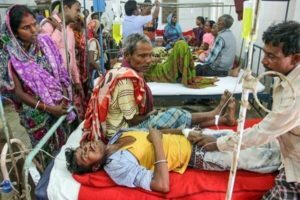 Police say that around 72 people are still admitted in hospitals, the doctors said that the number of the total deaths can rise. The police of Uttar Pradesh say that the adulterated liquor was consumed first in Uttarakhand where people from Saharanpur went to attend a funeral, they also brought back some with them after a villager sold it to them. The government suspects that the liquor came from Bihar, a place where the adulterated liquor is not allowed. The police have followed the instructions of CM Yogi Adityanath, and have formed teams to track down the liquor manufacturer. The police have seized adulterated liquor in Banda and some parts of the states. The Government of Uttar Pradesh suspended the District Excise Inspector of Kushinagar and the District Excise Officer amongst many other officials. The government has also suspended police officers. The UP police have arrested at least 30 people under the said incident, they will be charged under the Gangster Act and the National Security Act. The UP government also added that all the arrested people were involved in either manufacturing or distributing the banned liquor. Across UP since 2011, a total of 175 people have died due to consuming adulterated liquor. 4 of the incidents have happened during the reign of PM Yogi.